Rotary Districts 5040 and 5050 are two of 16 Districts in Rotary Zone 24, which includes 851 clubs in 30,850 members across Canada and in Washington, Alaska, Maine, Michigan and New York. 5. Global Grant-Area of Focus-Water and Sanitation (endowed) for 7%/ 5 gifts. 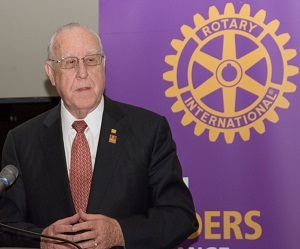 Rotary International President John Germ spoke at the Million Dollar Dinner about the dreams that have become realities, in our communities and around the world, through Rotary and The Rotary Foundation, now celebrating its 100th Anniversary. The first half of his presentation is included below, followed by second half which is an 11-minute or so basic audio recording. Each of you is a dignitary. You’re The Rotary Foundation. And you’re following a dream. That dream is Rotary serving humanity. Paul Harris, 110 years ago, had a dream. That dream was to get a group of people together and share fun, share fellowship, talk about business, talk about a classification principle and rotate around. It wasn’t until after that was started they came up with the idea that, maybe, we ought to do something to serve humanity. Whether you want to believe that that was an outhouse in Chicago or that it was buying a horse for a doctor to go out into the community, regardless, it was serving other people. That’s why you’re here tonight: you’re following Paul Harris’s dream – that dream to be involved in your community. But you’re also following the dream of an individual who was the sixth president of Rotary International, Arch Klumpf, who, in 1917, in Atlanta, Georgia, said we should create an endowment for doing good in the world. Rotary is a “person”. It has a head, feet, arms, lungs to breathe with, and, it has a heart. That heart is The Rotary Foundation. That heart started with just a simple contribution of $26.50. So think about what that $26.50, given by the Rotary Club of Kansas City, has done. It has created an endowment of about $1 billion. You have just contributed greatly to that endowment. About $340 million of that is in cash, and the other $660 million is in expectancies. That’s the beauty of The Rotary Foundation. 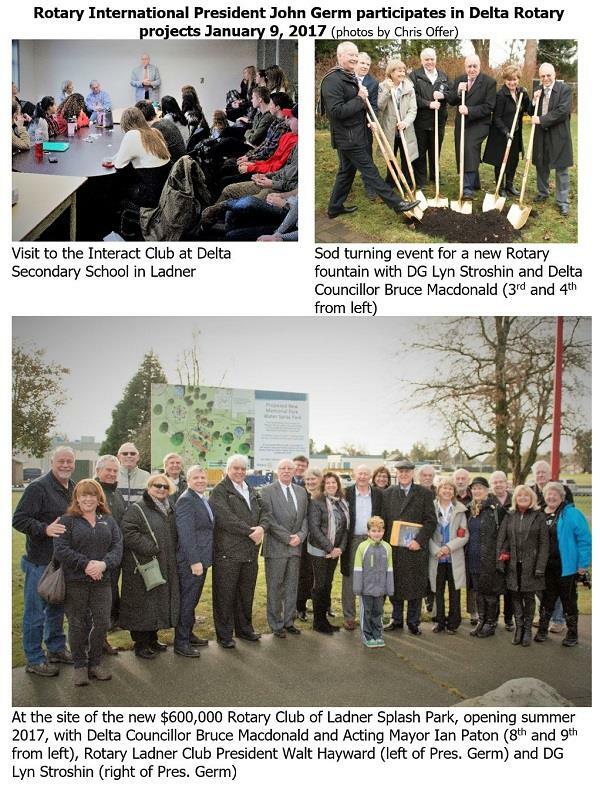 That $26.50 leaves us $255 million per year in grants, for projects such as the splash park [visited earlier in the day with Rotary Club of Ladner], the fountain [sod turning that day with Rotary Club of Tsawwassen] or Interact [visit that day to Ladner’s Interact club at Delta Secondary School] and how they are raising funds for a roller barrel to take water to the underprivileged in other parts of the world. 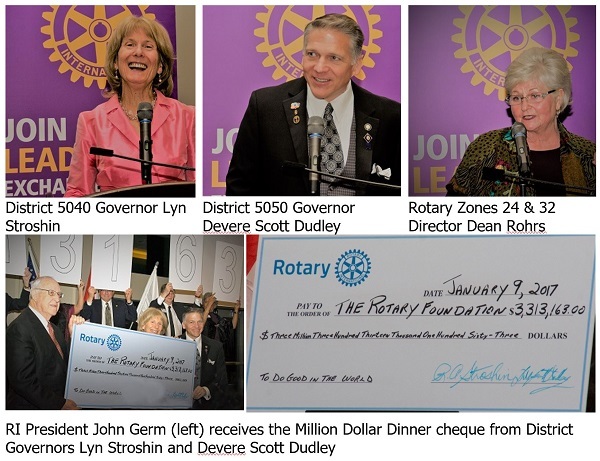 That $26.50 got us involved in a program that cost us $760,000 from The Rotary Foundation we now no longer have, “Health, Hunger and Humanity,” but that was the program that got us started on the road on our journey to eradicate polio. In 1979 Rotary International President, Sir Clem Renouf, had a dream: could we do something of the magnitude of eradicating smallpox, which had just been announced. Could Rotary do something of that magnitude in the world? Up until that time, Rotary had never done an international program. Our work had been confined to our communities, which is a great thing. That’s what has led us to our community grants program, led us into the District Grant Program. That’s what’s allowed us to do all the work in our communities to this time. But it also showed us that we had this international obligation. That obligation was Rotary serving humanity as we improve children’s lives. That program was so successful that in 1985, Rotary adopted a program to eradicate polio from the face of the earth. Individuals then said, “I have faith. I believe and, yes, we can in fact follow that example set in The Philippines and we can eradicate polio from the face of the earth. It was the same individuals who said, “We can raise $120 million,” because it was estimated that it would take that much to eradicate polio. Their math turned out to be not too good. We raised $247 million. Right now the Foundation is spending $105 million a year to eradicate polio. To date we have spent $1.4 billion. And we are committed to spending $1 million per year to eradicate polio.